PNTL’s nuclear security record is also flawless and PNTL complies with all security requirements recommended by the International Atomic Energy Agency (IAEA); the UK’s Nuclear Industries Security Regulations 2003; and is regulated by the United Kingdom’s Office for Nuclear Regulation (ONR). The Pacific Heron and Pacific Egret have been fitted with additional security features that enable them to transport MOX fuel and plutonium dioxide. For mutual protection, these vessels travel together, each escorting the other. They are fitted with fixed naval cannon and have other additional physical protection systems, only some of which are visible from outside. For shipments of MOX fuel and plutonium, armed officers of the CNC provide on-board protection from departure to arrival. 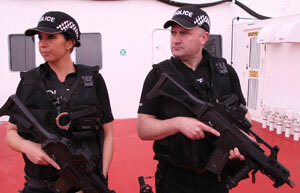 The CNC officers are specially trained to protect nuclear materials during sea transit, as well as nuclear facilities. In addition, the same measures that provide protection in the event of an accident also provide protection against potential acts of sabotage. Experts have identified other hazardous and non-hazardous cargoes that are transported by sea every day as potentially more attractive targets for sabotage.